In greenhouses atop the Vinegar Factory market and adjoining bakery on Manhattan’s Upper East Side, Eli Zabar grows fresh tomatoes, a wide variety of greens, strawberries, and even figs. Eli Zabar’s bakery and market on East 91st Street in Manhattan seems like a classic New York market with gorgeously displayed vegetables and fruits, a vast array of cheeses, and a wide assortment of breads and pastries baked next door. But Zabar’s market, the Vinegar Factory (named in reference to a prior use of the property), is anything but typical: it is part of an unconventional dimension of agriculture: farming that is intertwined with the urban landscape. In 1995, Eli Zabar began building greenhouses atop his two- and three-story brick buildings on the Upper East Side. These greenhouses, covering nearly a half-acre in area, are producing greens, tomatoes, berries, and even figs that are sold—not cheaply!—in his market downstairs. Zabar is a pioneer in a trend that is likely to grow dramatically in the coming years. He makes clear it is possible to integrate agriculture into the urban landscape—the sea of flat roofs and empty lots in our larger cities. The spike in energy prices in 2008 forced a lot of people to rethink the 1,500-mile journey that an average bite of food travels in the U.S. from where it is grown to where it is eaten. Shipping a head of lettuce from California’s Salinas Valley to New York takes 36 times as many calories as that lettuce contains. According to Lester Brown of the Earth Policy Institute, we consume two-thirds as much energy to transport food as we use to grow it. In other places the exact numbers may differ, but the enormous energy consumption of food production and transport is happening everywhere. Beyond energy cost, there are additional vulnerabilities in our food-production system. Prolonged drought in California, Spain, the Middle East and other areas threaten the vegetable-producing regions. This vulnerability is reviving interest in growing food locally. The closer to home that vegetables are grown, the healthier they are likely to be. Vitamins in fresh produce break down over time, and some vitamins may never fully form in fruits like tomatoes that are often picked green and artificially ripened in transit. The same goes with taste; vine-ripened tomatoes are far tastier than their machine-harvested brethren from hundreds or thousands of miles away. There may also be health benefits to smaller-scale production. In huge agribusiness operations, Salmonella outbreaks and other contamination problems become national problems affecting thousands of people. At a smaller scale, any problems that do come up are much more contained, with smaller impacts on the food supply. Finally, growing food closer to home can help to build awareness of—and appreciation for—food production. Many children growing up today have no relationship with farming; they have never seen a head of lettuce being grown, picked a tomato from the vine, or watched chickens scratching in the soil. Such awareness will help to build respect for the Earth and environment on which we all depend. Most big cities have a lot of vacant land. According to a 2000 study on average 15% of the city is vacant land area. This land can be used both for nonprofit and for-profit agricultural operations and community gardens. Back in 1968 in Chicago, Ken Dunn recognized the potential that vacant land offered for localizing food production and achieving social goals, and he launched City Farm. The farm is one project of the Resource Center, a nonprofit organization Dunn founded that runs a host of programs devoted to building community and strengthening local economies (www.resourcecenterchicago.org). City Farm began “mostly as a social justice project,” Dunn told . Over four decades the organization has farmed a varying area of unused land—currently about two acres (0.8 ha)—using a unique model of farming that protects food from being contaminated by the soils below. “Almost everything in urban areas is contaminated to some level,” Dunn said. He convinces owners of sizeable urban sites (typically one acre or larger) to “loan” the land to City Farm for several years. A site is graded and compacted, then an impermeable four-inch (100 mm) layer of local clay (typically sourced from construction sites as a waste product) is laid down on top of the existing soil. City Farm then puts down safe, uncontaminated compost on top of the clay, creating growing beds that are 24 inches (600 mm) deep. The farm is established in this compost, 1,000 tons of it per acre (2,200 tonnes/ha). 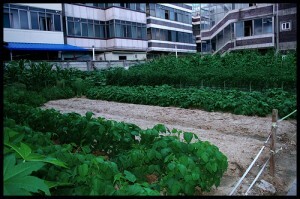 Along with various models of commercial-scale farming in urban areas, community gardens have also been growing in popularity. There are thousands of grassroots community garden initiatives throughout North America and elsewhere. Some involve just a few individuals sharing growing space on land owned by a city. Others are more extensive, with multiple garden plots on land owned by a nonprofit community gardening organization; some are on private land. In Detroit, another area suffering from extremely high unemployment rates, the nonprofit group Urban Farming has emerged as an important resource in the struggle to address poverty and hunger. 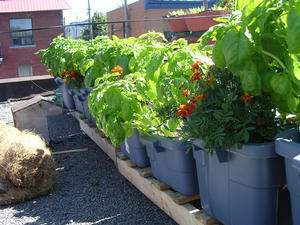 The organization, launched in 2005, manages or oversees more than 50 community gardens in Detroit, and it has expanded nationwide with hundreds of gardens in New York, Newark, Minneapolis, St. Louis, Los Angeles, and other cities—more than 400 sites total (www.urbanfarming.org). Harvested food is mostly distributed through local food banks, though neighbors are welcome to pick food for free. Conventional practice in commercial development of all types is to install shrubs and shade trees in a sterile landscape of mounded mulch and turf. One can walk out of almost any office building, school, hotel, or restaurant coast-to-coast, and see the same landscape. Why not devote some of that landscaping cost and effort to trees and shrubs that bear fruit? This is one of the ideas of permaculture, a landscaping practice (the word derived from “permanent” and “agriculture”) pioneered by Bill Mollison of Australia. While there are plenty of examples of homeowners replacing their lawns with edible landscapes there are no examples found of commercial buildings whose owners implemented an edible landscaping strategy. Why can’t employees at an office complex go outside for a mid-afternoon stroll and pick a ripe orange from a well-managed landscape of dwarf citrus trees? Why can’t schoolchildren and teachers pick cherries, raspberries, and apples during recess? Wouldn’t this be the “low-hanging fruit” of a transition to more localized food production? While Eli Zabar is a strong proponent of soil-based growing, much of the recent interest in rooftop greenhouses has focused on hydroponics, which involves growing plants in nutrient-rich water. This method offers a number of distinct advantages in rooftop applications. Benjamin Linsley of BrightFarm Systems in New York City (www.brightfarmsystems.com) consults on rooftop greenhouses and claims that hydroponic management is 10–20 times more productive than field agriculture, with far lower water use and higher reliability. Hydroponic can be very simple. Aquaponics is a relatively new approach to food production, combining both recirculation hydroponics and aquaculture (fish production). Some of the earliest research into aquaponics began in the 1970s. 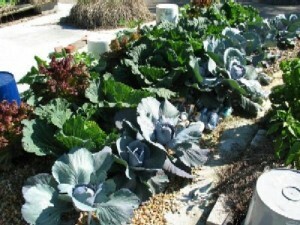 The beauty of aquaponics is that it offers a balanced nutrient cycle that does not require the addition of fertilizers. It also solves one of the significant problems associated with aquaculture: what to do with fish waste. 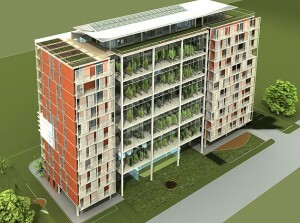 What about growing food inside buildings? It’s an idea that has been gaining some attention. 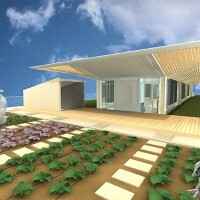 BrightFarm Systems is advancing an idea it refers to as the Vertically Integrated Greenhouse. This technique was originally developed to be incorporated between the layers of glass in a double-skin façade of a commercial building, a system that is more common in Europe than North America. Plants would be grown in little pockets on a vertical frame and managed hydroponically; the inner glazing would separate the greenhouse area from the occupied space. But “living or working with a relatively small number of house plants is fine, but when it comes to growing food crops in the home or office, the mismatch between what makes humans and plants comfortable can be problematic.” For optimal production, crops generally require higher humidity, stronger light levels, and hotter temperatures than one finds in occupied buildings. Some suggest that the ultimate in urban farming will be high-rise farm buildings that might produce everything from algae-based biodiesel to salad greens, eggs, beef, and milk. Magazines such as Time, Popular Science, and Scientific American have been rife with articles on this futuristic model of farming.